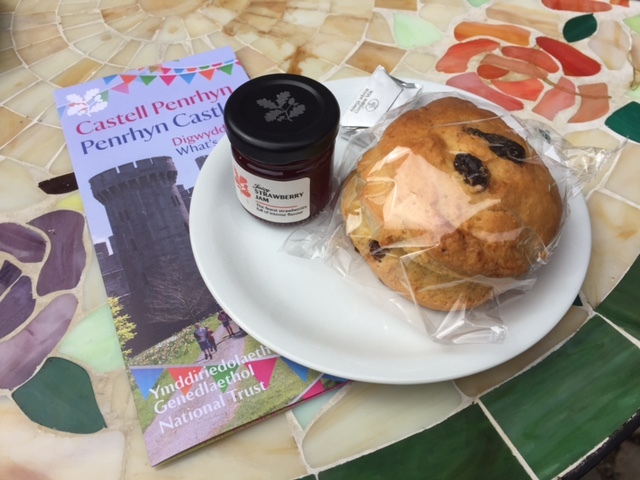 If I ever finish this Scone Odyssey, I expect the National Trust will want to reward me by giving me one of their many stately homes. We went back to Waddesdon today, because for the first time in three years I generously allowed the Scone Sidekick to pick our destination. 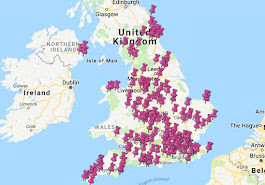 I have around 130 NT properties still to visit and I am getting increasingly worried that I'll never finish. So I was hoping he'd say Chedworth Roman Villa or Hidcote but he didn't. 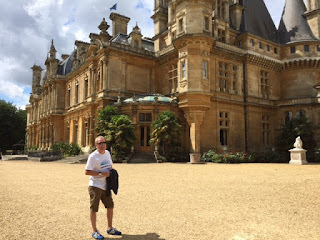 He absolutely loved Waddesdon on our first visit so that's where he wanted to go. 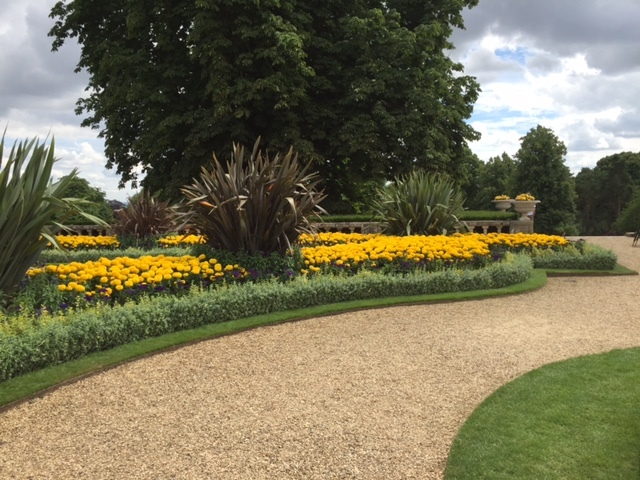 We also spent more time in the gardens - I'm afraid gardens always get short shrift from us on our visits. I always tell myself, a la Arnold Schwarzenegger, that I'll be baaaaack but I should really make more effort while I'm there. But onto the scones. 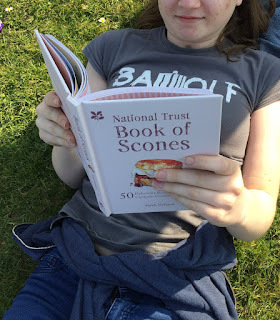 Scones don't get marks on revisits - like any decent quizmaster, I can only accept your first answer - but the Waddesdon scone was OK this time. On our first visit it got a unanimous five out of five; today it probably got a four. It was nice - it just wasn't as nice. I'll finish with a nice picture of the Scone Sidekick. It'll be three years before he gets to pick another property to visit, poor love. 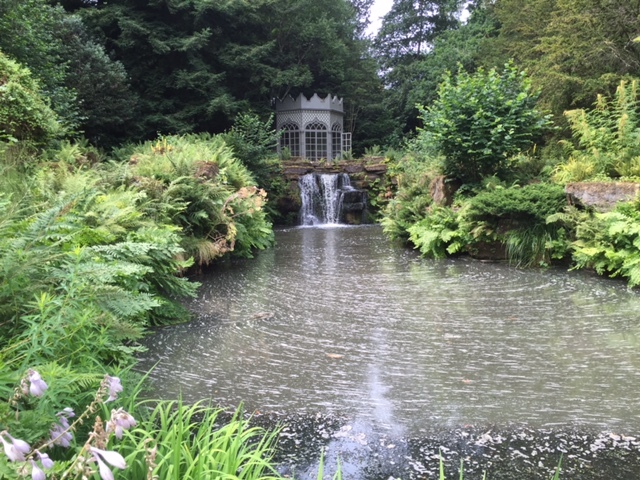 Woolbeding Gardens is a bit of an unusual National Trust property, in that you have to pre-book your visit. And then the instructions are all a bit MI5-like - 'arrive at this car park and wait for a bus to come and collect you' - as if you're going to discover that Oompa Loompas actually exist and are working as gardeners in Sussex. 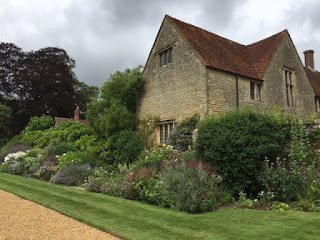 The other challenge is that Woolbeding is only open on Thursdays and Fridays. This is because the tenant uses the property as his weekend home and for some strange reason he doesn't seem keen on having hundreds of people clumping past his window while he's watching Saturday Kitchen. So if I'm being honest, all of this faff meant that I wasn't feeling particularly positive about Woolbeding. And then I got there and I absolutely LOVED it. There have been people in Woolbeding since Saxon times! He planted a tulip tree which grew to be the tallest in Europe! It was blown down during the Great Storm of 1987, missing the house by two feet! Eek! William Pye tells the story of the fountain on his website - he was taking the brief for the commission when he suddenly realised that he had visited the house as a boy 60 years before and sat under the very tree he was commemorating! Amazing! I can't recommend the Pleasure Ground enough - there are so many lovely little spots and features to see. 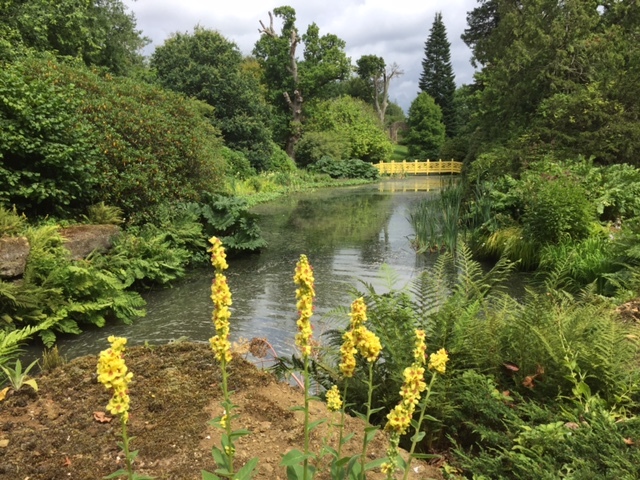 And I had it pretty much to myself - for all my whingeing about it being difficult to get to and only open for 5 minutes a week, it was a lovely experience to stroll around in peace and quiet, with only a few other people milling about. But I didn't just come to admire an English country GAR-DEN. 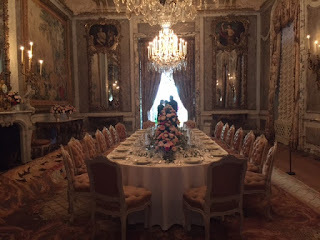 I came to admire English country SCO-ONES and that's what I did in the very lovely tea-room. The staff were particularly lovely and friendly and my cream tea came with two generous scones. I occasionally come across a scone that tastes different in every mouthful, and that happened today. They were a tiny bit dry but very tasty. I've also decided that when I have finish all the scones, I might start a Toilets of the National Trust blog because Woolbeding has the loveliest loos ever. 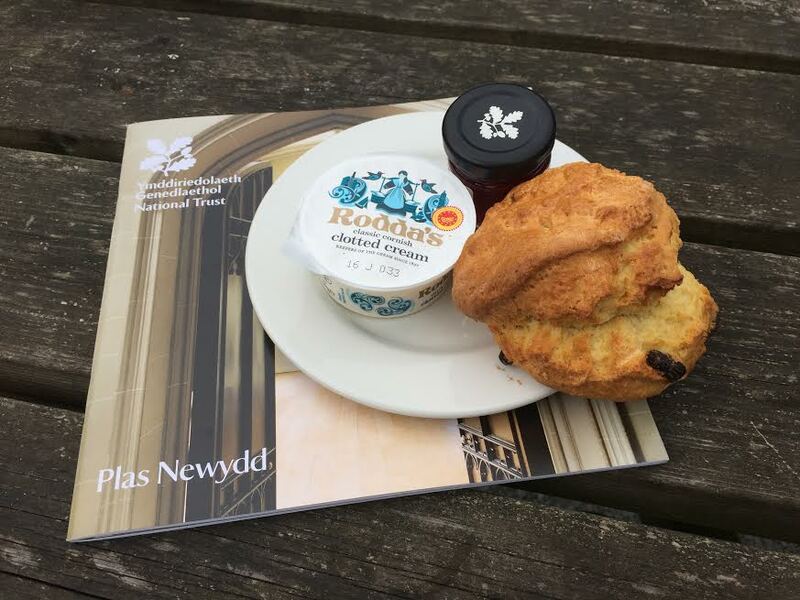 I am often asked the question "Scone Blogger, what inspires you to visit one National Trust property over another? Why a flour mill in Hebden Bridge over a dovecote near Biggleswade?" The answer is that there are many factors. I obviously look for scone potential. I like a dollop of historical scandal. A priest hole is always a bonus, as is a cat. 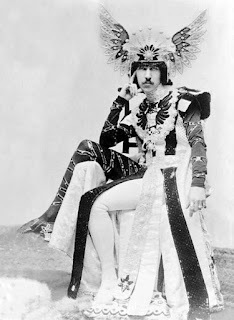 This, my friends, is a picture of Henry Cyril Paget, the 5th Marquess of Anglesey. You're probably shaking your head right now, thinking "that Freddie Mercury has a lot to answer for" but Henry Cyril DIED IN 1905! This picture was taken before 1905! My mind was blown. Llanfairpwllgwyngyll has the longest single word place name in Europe, and the second longest in the world, apparently. I'm so glad that this is a written project AND that copy and paste exists. 2. 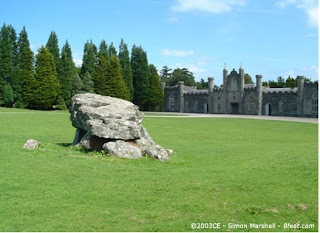 Plas Newydd has a 5000 year-old burial place! A long, long, long, long time ago, someone took the trouble to push five big boulders together to create a burial chamber (or cromlech) for a Neolithic chieftain - and it's still there today! 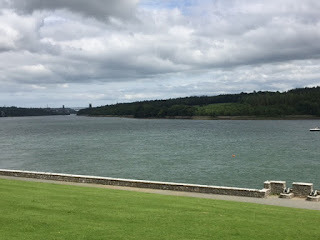 Anglesey was a stronghold of the Celtic Ordovices tribe and its Druid leaders apparently - the Romans referred to Anglesey as Mona but failed to conquer it until 79AD, when they massacred everyone. 3. Plas Newydd in Tudor times! 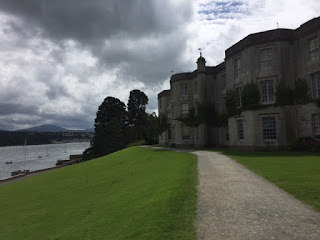 In the 15th century, Plas Newydd belonged to the Griffiths family, passing to the Bagenals through marriage and then, in the early 17th century, to the Baylys, also through marriage. 4. 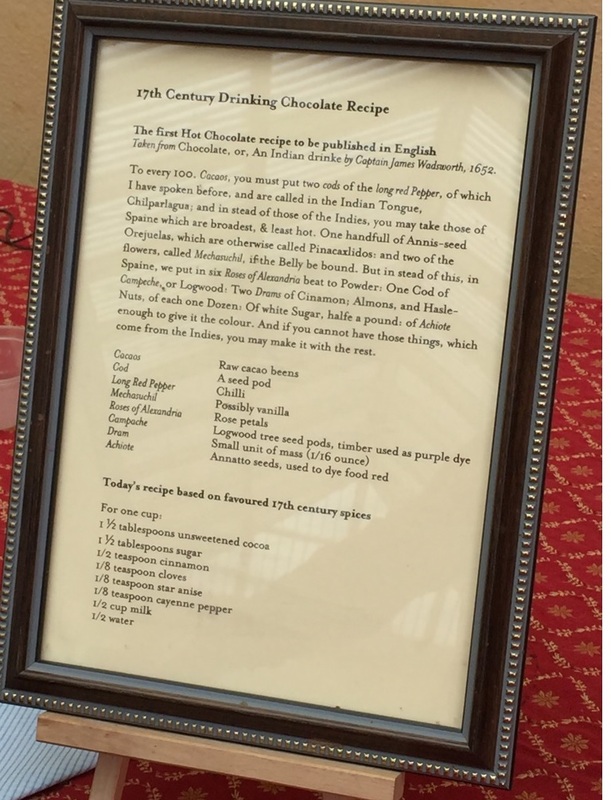 Then came the Pagets! In 1737, Sir Nicholas Bayly married Caroline Paget. Her great-great-great-great grandad, William, had been made 1st Baron Paget following a successful career in the courts of Henry VIII and Edward I. When the 8th Baron Paget died, Caroline and Nicholas's son Henry was next in line, so he changed his name and took the Paget title to Plas Newydd. 5. Henry built a new Plas Newydd! 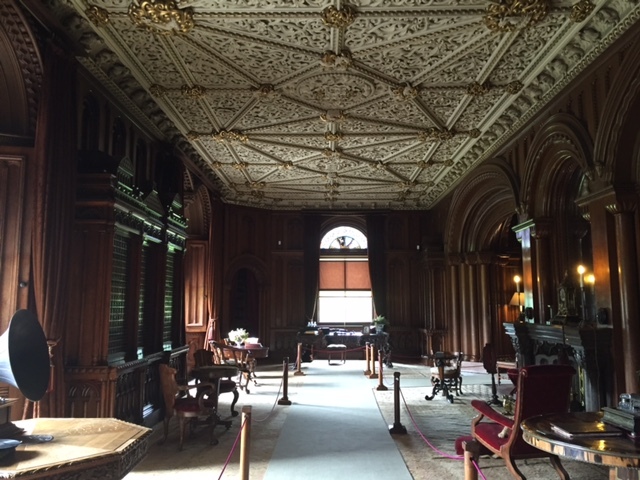 Henry rebuilt Plas Newydd in a hybrid Neo-classical-Gothick style, which is the house we see today. 6. 'One Leg' Henry delivers the scandal! Henry's son, also Henry, was a very interesting character. He made a name for himself through his military escapades during the Napoleonic Wars, before scandalising society by leaving his wife and eloping with the Duke of Wellington's sister-in-law. Henry and the Duke were presumably friends again by 1815 when they fought together at Waterloo. The guide book describes the moment Henry lost his leg; "By God, sir, I've lost my leg!" he is claimed to have said to Wellington, who replied "By God, sir, so you have!" Henry then had what was left of his leg amputated with no anaesthetic. 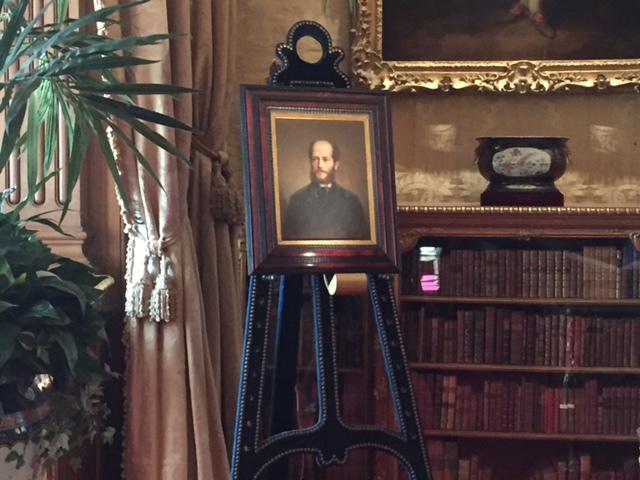 He was made 1st Marquess of Anglesey for his efforts and his prosthetic leg is on display in the house. 7. Then came Henry Cyril! 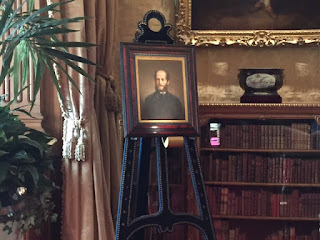 Henry 'One Leg' actually did very little to Plas Newydd, and nor did his son or eldest grandson. His second grandson, the 5th Marquess, was the Henry Cyril mentioned above. There was always gossip about whether his real father was actually a French actor, and Henry's love of acting and jewellery did little to dispel those rumours. 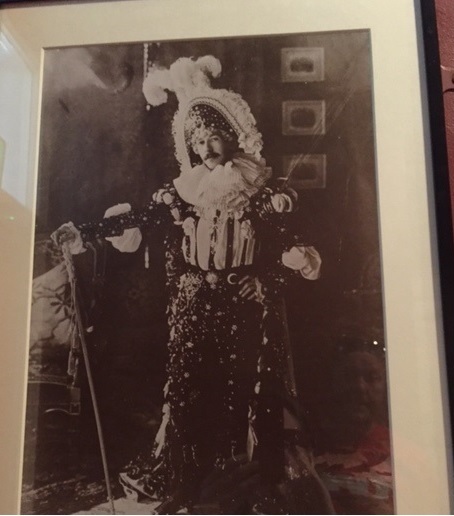 He built a theatre at Plas Newydd by converting the chapel into the 'Gaiety Theatre'. The first production was Aladdin, in which he had a starring role. He also did his solo Butterfly Dance, after which he handed out photographs of himself to a baffled audience. But it all ended badly, with debts of £544,000 and bankruptcy in 1904, followed by his untimely death aged 30 in a hotel in Monte Carlo a year later. Poor old Henry Cyril - they even sold his pet dogs, complete with their little silk jackets embroidered with his coat of arms. Where did it all go wrong. 8. Rex Whistler did the dining room mural! The 6th Marquess was Henry's cousin Charles. 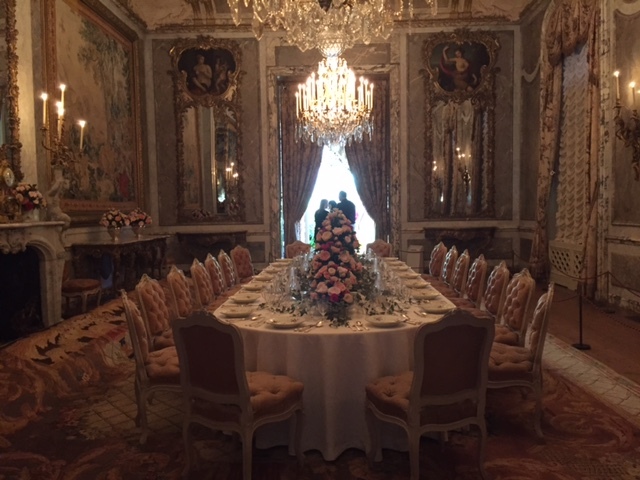 He sorted out the debts and turned Plas Newydd into a comfortable country house - many of the rooms are presented as he and his wife, Marjorie, had them, with 1930s style bathrooms and bedrooms. 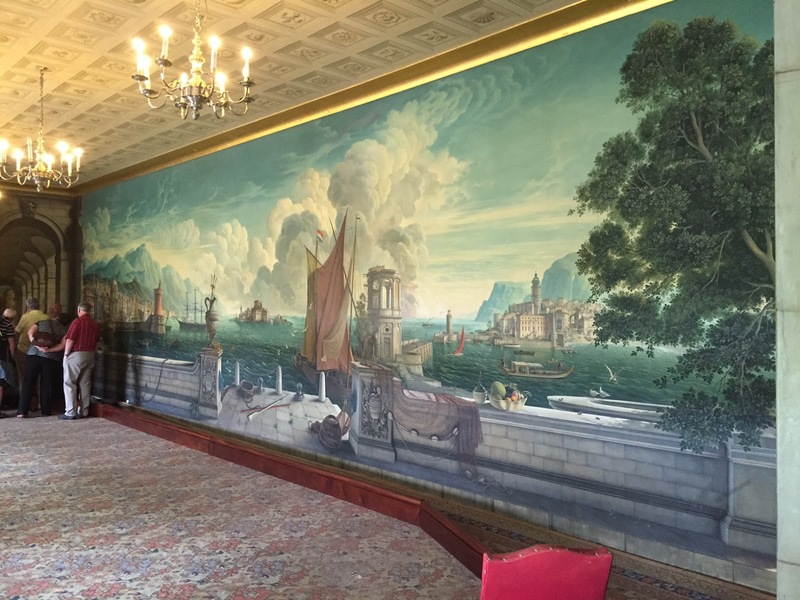 Charles and Marje were also great friends and supporters of Rex Whistler, and he painted an enormous mural for their dining room. It takes a few liberties with reality - he painted the mountains of Snowdonia behind a harbour scene featuring a Venetian gondola and some baroque buildings he had seen in Austria - but what's wrong with that? He put himself in it too, pushing a broom. 9. The NT took charge in 1976! Lady Marjorie must have been one very relieved woman when she gave birth to twins in 1922 and one of them was a boy - she'd already had four girls. In 1976, however, the 7th Marquess gave Plas Newydd to the National Trust, although he continued to live there until he died. 10. The views are stunning! 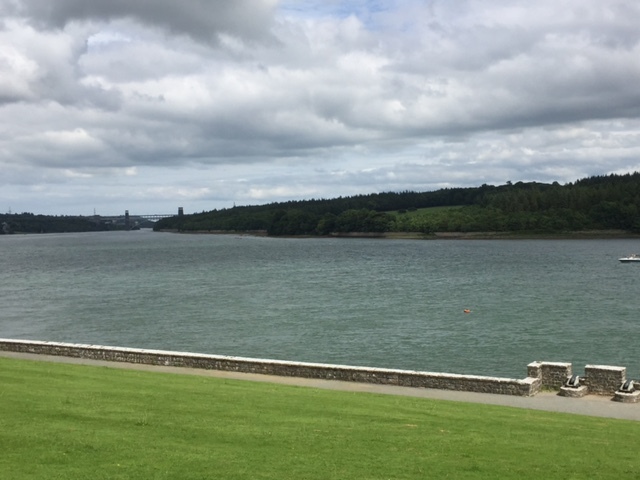 The house is in the most fantastic location - overlooking the Menai Straits and the Menai Bridge (as you can see below) while also facing the mountains of Snowdonia. It's a stunning spot and I highly recommend you spend a day there. But let's move on to the scones. I had already had a very disappointing scone experience by the time I got to Plas Newydd and so my expectations were low. 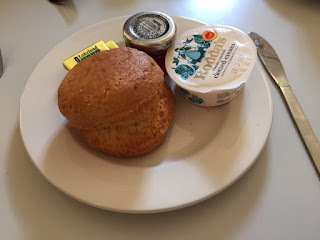 We did make the same mistake of going into the first tea room that we saw - there's another one nearer to the house - but this time it didn't matter at all; the scone was absolutely delicious. It was fresh as anything, light but substantial, and very tasty. But let's end with another picture of Henry Cyril (or Toppy as he was known to his chums). What a legend. What would you do if you received a call one day saying that Alan Sugar had died leaving everything to you in his will? All of his businesses (even that plastic surgery one) and a huge sprawling estate with a house on it? The only drawback being that the estate is in North Wales and you live miles away and have never even been to North Wales? This is sort of what happened to a man called George Hay Dawkins in 1808. His distant cousin, Richard Pennant, was the owner of sugar plantations in Jamaica as well as slate quarries in Wales. When he died childless, he left everything to George. Yes, this ancient-looking fortress might look a thousand years old but it was actually built less than 200 years ago. George didn't want to build a Georgian house - with its location high on a hill near to Caernarfon Castle and Conwy Castle, he wanted something spectacular. 20 years and a king's ransom later, he got it. But if you think the exterior is impressive, you should see the inside. It is quite literally STUPENDOUS and probably the most amazing interior I have ever seen at the NT. And I wasn't alone in thinking this. The Scone Sidekick is a builder and when I am wandering around NT properties admiring scones and cats and pictures of scandalous adulterers, he is looking at door hinges and examining flooring. At the end of today's visit he said simply "I am speechless". Which says it all. 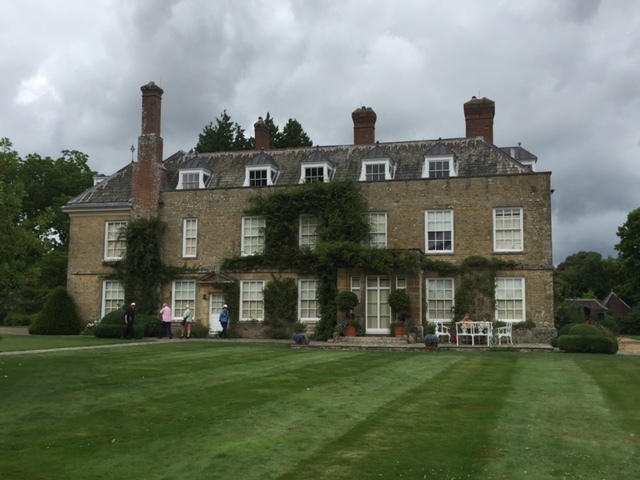 It was bought by a John Williams who became Archbishop of York - the guidebook quotes a biographer on how John fell from a wall as a child and "the fall was on so critical a part as ever to secure him from all reproaches of unchastity". Eek! When Richard died, George decided to replace the house that Richard had created and work started on his 'fairy castle'. It was built using local oak, slate, marble and a workforce that had been laid off from the quarries during difficult times for the industry. 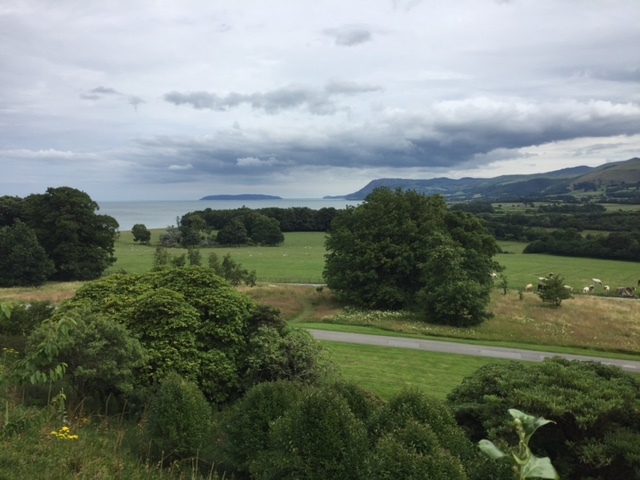 It is very sobering to look at Penrhyn knowing that it was built on the profits of slavery - our friend George opposed the electoral reform that led to the emancipation of slaves in 1833, and he was paid almost £15,000 for the 764 slaves that were freed from his estates. Anyway. Let's move on to the scones. I'm not going to go into detail about the whole saga, because things go wrong for all of us sometimes and the poor service was probably just unfortunate. But the staff didn't know any of that - presumably they just thought that I was making it up or being difficult or trying to get something for nothing. I don't know. We were just left with two scones that we couldn't eat. Anyway - the beauty of this scone project is that if the scones don't work out, the property usually makes up for it and that's exactly what happened today. 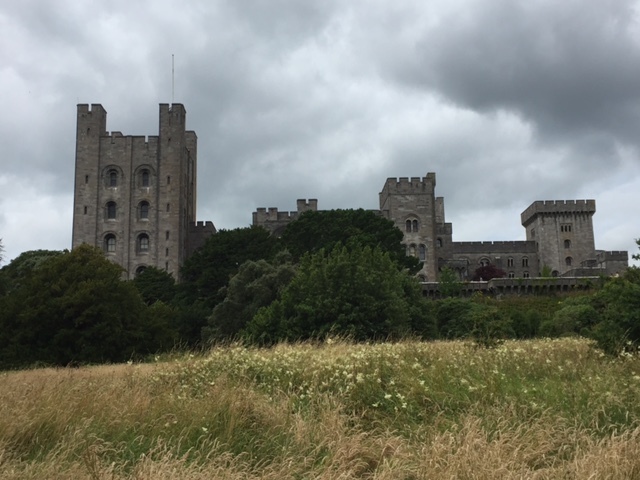 I can't recommend Penrhyn Castle highly enough - it's stupendous and well worth a visit. BIG NEWS! 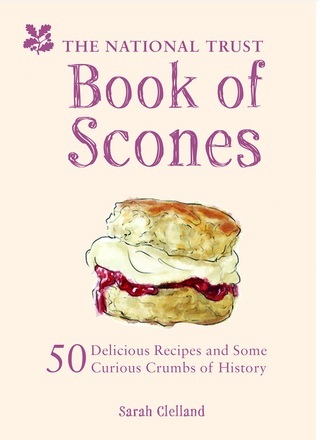 Around England in 50 Scones book coming soon! Here's a story for you. When I was 6 or 7, someone bought me a book from The Garden Gang series. You may remember these books if you came of reading age in the early 1980s - Roger Radish and Simon Swede etc. Anyway, when I discovered that the author, Jayne Fisher, was 9 YEARS OLD I nearly had a cat. I decided right then and there that I would beat her and have my name on a book EVEN YOUNGER. I may even have started writing that very afternoon - no word of a lie, my opus was called The Coin Gang and starred a 10p called Terry and a 5p whose name I mercifully can't remember. Freddy probably. Anyway. I probably don't need to tell you that I did not become the youngest ever author of a Ladybird book and the world remains untroubled by the Coin Gang. BUT!!!!!!! Never give up on your dreams, kids, because 36 years later, I am about to contribute to an actual book! 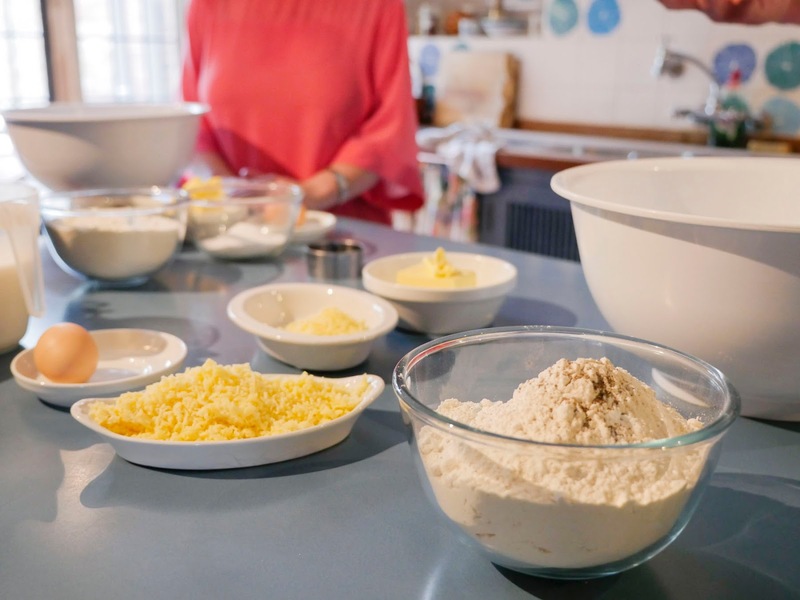 Yes, the National Trust will be publishing a tome called Around England in 50 Scones, featuring scone recipes from National Trust chefs around the country with some commentary from yours truly! And as if this wasn't exciting enough, I also recently got to meet Clive Goudercourt, the Development Chef at the NT. 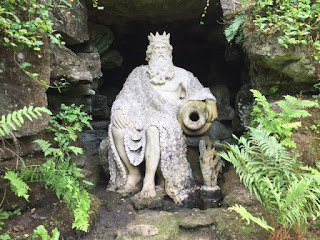 For some reason I always want to call him Sir Clive Goudercourt - I think he has the perfect name for a knighthood, plus as King of the Scones at the NT a summons to the palace can only be a matter of time, but for now I better stick with 'Clive'. 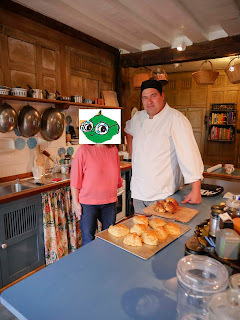 Anyway, Clive showed me how to bake fruit scones and cheese scones in the lovely kitchens at Grey's Court. A massive thank you to Clive, Tessa, Emily and everyone else that made that possible - it was fantastic and I got answers to a gazillion questions about scones and the NT. Here are a couple of pictures - I'm boringly and probably unnecessarily remaining incognito for now, just in case a chef spots me and refuses to let me in to his/her tearoom when I still have 120 properties to visit. I'll keep you posted on when the book is out - it'll be sometime in the Spring! NB: It's out! You can find it in most NT shops, on the NT website, or on Amazon! 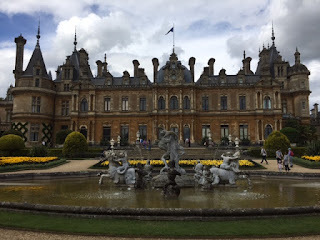 If I were in charge of the finances of a National Trust property, my favourite words in the world would probably be 'coach party' or, maybe a bit more ambitiously, 'billionaire Mark Zuckerberg discovers his ancestors built National Trust estate'. But my most hated words would definitely be 'roof repairs'. It must be GALLING to have to replace the roof on a stately home. It must cost MILLIONS OF POUNDS for something that nobody can really see. If someone offers to sell me a raffle ticket to restore a fishpond currently containing an old shopping trolley and a mattress, I'm all over it. 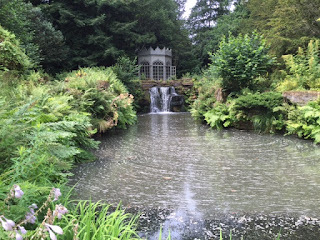 A summer house with no glass that needs repairing? Delighted to help. But a roof? Are you sure you can't just put a tarpaulin over it? 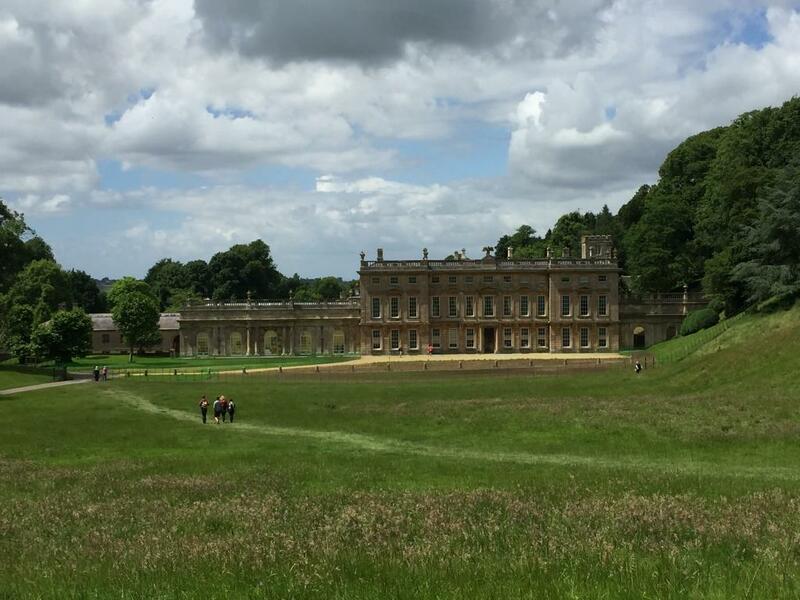 Dyrham Park near Bath replaced its roof last year. It cost - pass the smelling salts, mother - £3.8 MILLION POUNDS. It's also very disruptive to replace a roof. The whole house was covered in scaffolding while the work went on, which must have put a lot of visitors off. It certainly put me off. 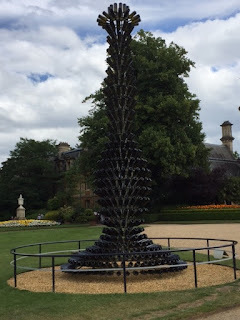 But the staff at Dyrham did a brilliant thing; they made a feature of it. You could actually go up on the roof and see the replacement works going on. I think that's such a brave and clever thing to do - much better than just claiming everything is business as usual, even though 90% of the rooms are shut so disgruntled visitors pile onto TripAdvisor to complain. ANYWAY. The scaffolding is down, so I got to see the outside of the house properly. And it's a beautiful house - you can either walk from the visitor centre or you can catch the shuttle bus, but in either case you get a lovely view as you come over the hill and look down into the valley. Mary married William Blathwayt, a very successful civil servant who had risen to become Secretary at War for James II. We can only wonder what first attracted him to the rich, estate-owning Mary Wynter. 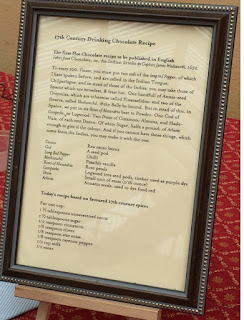 But on to the 21st century scones. 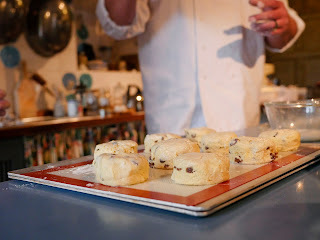 I recently had the privilege of spending a morning baking scones with Clive Goudercourt, the Development Chef at the National Trust. He showed me how the perfect scone should have a 'mouth' - ie, as it rises, the scone should split slightly so that it can be divided easily by hand without a knife. So when I looked at my Dyrham scone I shook my head sadly at the Scone Sidekick. "There's no mouth on this one, Sidekick," I said. "I've got insider information on this now. This one won't pass muster." He looked slightly baffled and tucked into his scone as I bit into mine. "Actually, it's not bad," I said. Another bite. "It's actually really good." Last mouthful. "Top marks, I'd say." He gave me a slightly tired look that said 'do you actually even know what you're talking about?' 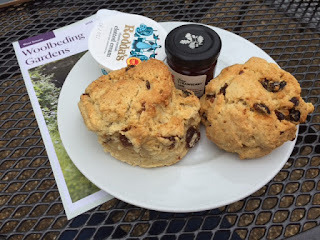 But bravo to the Dyrham scone baker. 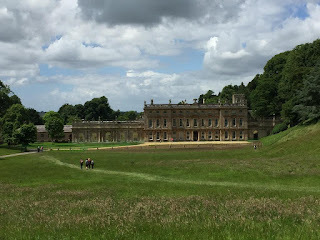 So I really take my hat off to Dyrham. They're trying very hard to keep the place going during the ongoing conservation works and that can't be easy, plus top class scones and hot chocolate to boot.